When you imagine a tattoo from Texas, you might imagine one of a cowboy owing to the worlwide fame of Texas ranches. 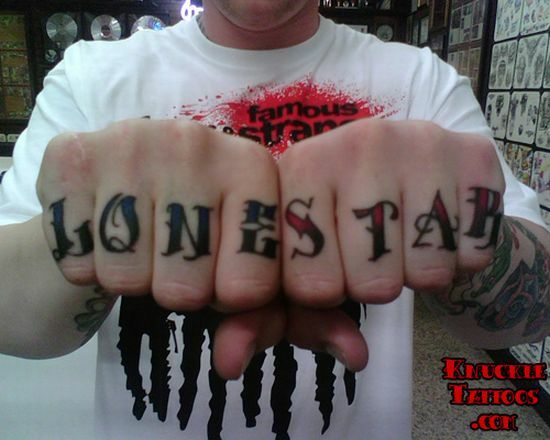 But contrary to this belief, the tattoo is on the knuckles and shouts “Lonestar” owing to the nickname of this American state – the lonestar state. In true Texan spirit, Cody P. flaunts the nickname of his hometown and confesses to have some more Texas inspired tattoos on his body. While at it, he advertises the gill monties shop as the creative genius behind this patriotic work! ← Create your own ‘Devil Angel’ tattoo!